Chatbots are here to transform the future. As per a Forrester report, 57% of companies are already using Enterprise Chatbots or have plans to begin with one this year. Estimation is that chatbots will explode the global market with over US$1.9 Bn by 2020 and expected to clock a CAGR of over 30% by next decade. The reason for the major shift with Chatbots is largely attributed, to the quick responses that modern consumers demand eliminating the wait time to connect with customer executive. Furthermore, consumers have also got accustomed interacting with voice based enterprise chatbots on a regular basis like Apple’s Siri, Google’s Google Assistant, and Windows’ Cortana, and not to mention Amazon’s Alexa. What is an Enterprise Chatbot and why do they exist? Text based AIs equipped to handle customer queries that do not require human intervention can be defined as enterprise chatbot. They respond to queries over instant messaging or social networking platforms. A customer executive can handle a maximum of 2-3 customer queries only at a single point of time and handling numerous queries would result in huge manpower costs. The need for consumers to wait for a customer service executive to respond to their query has become high with increasing number of customer complaints. With the use of Chatbots, the wait time is eliminated as the response from an enterprise chatbot is almost instantaneous resulting in a happy and satisfied customer. Furthermore, the customer is able to reach out on demand at any time, without the worry of being left stranded at odd hours. This also helps enterprise to save substantial revenue in man power. Enterprise chatbots have the ability to initiate a conversation with potential customers; while they visit the website and browse through the products & services. Chatbots can provide extra information that a user may ask regarding the services immediately. Enterprise chatbot today are even equipped with assisting the user to perform basic tasks as well, using the right commands. This adds to the cost saving ability of an enterprise, thus resulting in improved ROI. As an instructive example, check how an intelligent chatbot on Saviant Energy Analytics Platform (SEAP) for Utilities provides an instant conversational experience. It interacts with Enterprises in a more human way, providing quick answers to their queries while they take the solution tour. 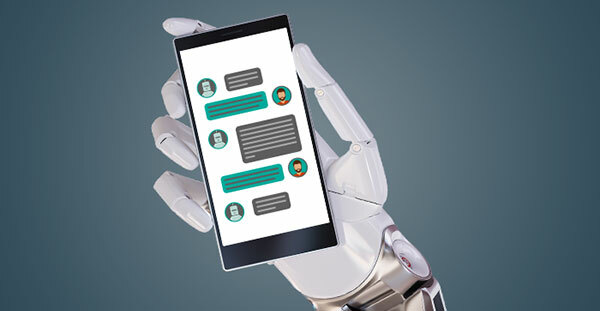 The integrated chatbot, developed using Azure platform, is responsive, performant, scalable and possesses language skills to help Utilities understand the business value of the solution. Not only enterprise chatbots have been able to engage customers in providing the next level customer service, but they have also been able to push the barrier in automating many of the enterprise’s processes. These chatbots engage the customers over messaging platform by asking relevant questions to contextualize the responses and automate over 40% of the processes. Enterprises can publish a cost-effective Chatbot using Azure Bot service quickly. Using Visual Studio or any integrated development environment (IDE), certified Azure developers can help them build such chatbot quickly. Some irritated and angry customers tend to haggle but Enterprise chatbot can remain neutral and respond to their queries without the ardent stress. This helps in making the interaction more beneficial and efficient in comparison to human interactions. With so many evident advantages of an enterprise chatbot like the one for SEAP, it is a matter of time when every enterprise will have their own chatbot. And, the entire customer service experience will be handled by AIs equipped with top level machine learning capabilities. The time is not far when you might end up interacting with a chatbot more than your human counterparts to get something done.